Up to now, the focus of the investigation has been on Black Rock lighthouse. AIR ACCIDENT INVESTIGATORS say that the missing Coast Guard helicopter Rescue 116 may have hit rocks at the Black Rock lighthouse. The Dublin-based helicopter has been missing since last week after going missing while preparing to refuel at Blacksod in Mayo. Captain Dara Fitzpatrick was recovered from the wreckage and died later in hospital but her crewmates Captain Mark Duffy, winch operator Paul Ormsby and winchman Ciarán Smith remain missing. In a statement this evening, the Air Accident Investigations Unit (AAIU) extended its sympathies to the families and friends of the crew of R116. Chief Inspector Jurgen Whyte, in consultation with Investigator-in-Charge, Paul Farrell this evening released a statement saying that the damage on the helicopter’s tail indicated it may have struck rocks. Up to now, the focus of the investigation has been on Black Rock lighthouse, a rocky island some eight miles from Blacksod. Now investigators believe the tail struck rocks on the western side of the island. However, they do no say if that is the reason the helicopter came down. “A significant amount of wreckage has been recovered from the sea and this has been logged and will be brought to the AAIU wreckage facility in Gormanston, Co Meath, for detailed examination. “Furthermore, the AAIU has visited Black Rock Lighthouse, on the approaches to Blacksod bay, which is close to the last recorded position of the helicopter. Some helicopter wreckage has been recovered from the general area of Black Rock Light House. This wreckage is primarily from the tail area of the helicopter. At this early stage in the investigation it is not possible to be definitive about the exact nature of damage to the recovered wreckage or indeed the circumstances of the accident. However, there appears to be marks on some of the recovered wreckage which are consistent with the tail of the aircraft contacting rocky surfaces on the Western end of Black Rock. The investigation has not yet definitively identified the initial point of impact. Search vessels have detected a signal which is believed to be from the underwater locator beacon attached to the aircraft’s black box, but diving teams have been hampered by poor weather. Taoiseach Enda Kenny today visited the site and met with volunteers involved in the search. Email “Investigators say Rescue 116 could have hit rocks at lighthouse”. 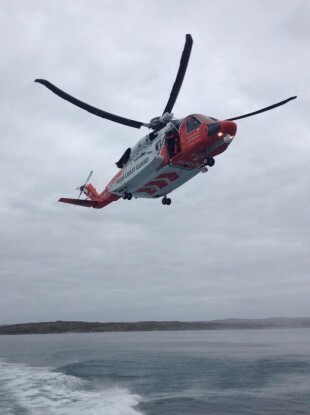 Feedback on “Investigators say Rescue 116 could have hit rocks at lighthouse”.